I have put together this guide to aid in planning the right cake for your wedding as well as enjoying it on the day. Many Wedding Cake pictures can be found in the Gallery. You can choose to have all sponge cakes, all fruit cakes or fruit and sponge cakes of different tiers and different flavours. In the assembly of a stacked, fruit, sponge or combination, the fruit cake does not have to be the bottom tier. Ignore the fallacy that you can’t put a fruit cake on the top of a stacked cake or that it must be the bottom tier, when combined with sponge cakes, as cakes are secured with supporting rods between the tiers. Cakes can be stacked or you can make a smaller cake ‘stand out’ by using pillars, separators, or choose from my range of elegant cake stands 2, 3, 4, 5, and 8 tier stands which are available for hire. Base cake stands of Chrome, Silver, Gold and several others are also available. In an emergency, I can produce a decorated cake at short notice, as short as three days, subject to my time being available, of either a Rich Fruit Wedding Cake or Sponge Wedding Cake. These days Rich Fruit Cakes don’t necessarily need to be matured and can be made to order within a week subject to time availability. Its your personal choice! However, all cakes are made to order and Sponge Cakes have a short shelf life and therefore can only be made a few days before and during the week of your Wedding or Event. Prominently displayed for all to appreciate, the wedding cake is usually carefully coordinated with the colours, design of the wedding dress, flowers, and any wedding decorations, or wedding colour theme for the day. Wedding cakes are as much a traditional part of weddings, as the bride being late, and the best man fluffing his speech. Ceremonies just wouldn't be the same without the cutting of the cake. Alongside the Bride and her Attendants, the contemporary Wedding Cake is a focal point of the reception or wedding breakfast so it’s important to take care of the details well in advance. This means deciding the style and size of the cake you want and in the peak season from April to September, preferably three months before the Big Day as many Cake Makers, like myself, can get booked well in advance. Traditionally, the Wedding Cake is a symbol of fertility. Historically it was broken over the brides head to ensure good luck and fertility. This practice was symbolic in marking the end of the bride’s virginity! Far removed from the previous generation of standard cakes, selected only by the number of tiers with the decoration left to the imagination of the local baker's shop, the Wedding Cake has become an artistic creation - the piece de resistance of every cake decorator. How to chose the right cake whether it’s for a large or small wedding, traditional or informal, you need to consider how many people you want to cater for, and I am here to help you get it right. If you want to buy a tailor-made Wedding Cake, please don’t leave it to the last minute. Our beautiful and delicious cakes, combined with our friendly, no-problem attitude, will help to make your event a complete success. But what exactly are wedding cakes, and what is their role in the big day? How do you figure out how much you should spend? Which wedding cakes are the best? There are many questions you will have when you start to think about wedding cakes. But rather than us telling you what you should and shouldn't do, we thought it would be best if you heard it. Set your budget first - once you have an idea of how much you can spend, you can start talking to wedding cake designers about what you want. Think about the type of filling you want for your wedding cake. Fruitcake is more traditional, but slightly heavier. Chocolate cake is a lighter option, but isn't particularly traditional. Sponge cakes are an even lighter option, easier on the tummy and quite a safe bet. While other options such as coffee and walnut cakes, or carrot cakes, offer something a little different. Decide whether you will let people take the slices away with them or serve it as dessert. Bear in mind that, with enough imagination, you can get beautiful wedding cakes on smaller budgets. It is possible to cut corners and save money. As a Designer, I can improvise - you don't have to have all the cake as part of the tiers on display to our day guests, and cutting cakes can be provided for your Caterers to cut up for your evening guests. Book your cake plenty of time in advance of the wedding – as a designer, I can get booked up very easily, so the sooner you can book, the better. When you are booking your cake, you will need to have as good an idea as possible of the number of people you will be catering for. A bove all else - make sure you choose what you want - it's your wedding day remember! Wedding cakes are the perfect way of indulging on your guests whatever you go for. I offer a free consultation to discuss your needs and ideas. Wedding cakes are conventionally white, which dates back to Victorian times when white signified purity. Today wedding cakes can be made in any imaginable colour and many couples choose to have a cake which incorporates a range of colours to suit their theme and style for the day. If you are ordering a small cake for a larger venue, you can make it ‘stand out’ by using pillars, separators, or choose from a range of stands. Round wedding cakes are the most popular and the circular design is a symbol of eternity as it has no beginning and no end. Other designs include Square, Heart-shaped, Oval, 3 Petal, 5 Petal, Horse Shoe, Bell Triangle, Octagon, Hexagon, Rectangular to name but a few, or lots of individual mini cake, cupcakes or iced cakes for smaller weddings. Many couples choose to have the top tier made from fruit as it keeps well over time and can be served again. This custom dates back from times when the Christening of the first child would take place shortly after the wedding and the remaining cake would be used for this Celebration. As some modern couples have already started a family and others wait a few years before starting a family, many couples often share the top tier for their first anniversary. Flowers tend to be the most popular way to decorate wedding cakes and couples can choose from fresh, artificial or sugar flowers. Wired Sugar crafted and artificial flowers can be made to look very real and can provide a nice keepsake from the wedding day. If using fresh flowers, I am happy to liaise with your florist to ensure that the flowers used for your cake are in keeping with those used on the day by your florist. However, it must be remembered that you don't want to poison your guests with the chemicals sprayed on fresh flowers, so fresh flowers must not touch the cake. Other decoration ideas include ornaments, sweets, chocolates and sugar-craft objects as well as the traditional bride and groom on the top of the cake. As most cakes are on display throughout the reception it is important to choose a filling for your cake which will not spoil if left out of the fridge. Butter creams, jams and fudge fillings are good choices while fresh cream and mousse are best avoided. Some couples choose to display a smaller cake and have an additional (undecorated) cutting cake which is cut up by the caterers and served in addition to the display cake to save costs as the guests will not know that it is not part of the cake. If you are using a simple design, I may not charge a lot more to incorporate the additional cakes into the design so it is worth asking. It is important to order your cake as far in advance as possible if your wedding is over the summer as May through to September is the busiest time. otherwise the general recommendation is to book your cake 3 – 6 months in advance. Subject to availability of time, any cake can be made a short notice even within a week! If you require fruit cake, there is no hard and fast rule regarding timing, because a fruit cake can be made at any time and you have the choice of a cake matured with Brandy for 2 - 3 months to allow the fruit cake to mature, or one made the week before the wedding. Non Alcoholic cakes, dairy free, gluten free, vegan, are also available; all dietary requirements catered for. Sponge cakes are only usually made the Wednesday for a Saturday wedding, (or 3 days before) and can be made at shorter notice although this will depend on my diary schedule. I will require a deposit to secure the booking on your date with the remaining balance payable no later than three weeks before the booked date. The cutting of the wedding cake is symbolically the first task that the bride and groom undertake together and represents the bride and groom starting their new life as a couple. Traditionally the groom used his sword to help the bride cut through the royal icing, but today an attractive silver knife is the preference and this part of the reception should be watched by the guests. The groom should place his right hand over the bride’s right hand and they cut and eat the first slice together. The cake should then be taken away to be cut. 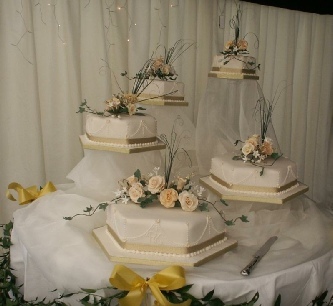 Wedding caterers should know how to cut a wedding cake, but if you are not using caterers and plan to cut the cake yourselves please contact Anne’s Cakes for All Occasions and a guide can be sent. The custom is that every guest should have a small piece of cake to bring good luck to the couple. 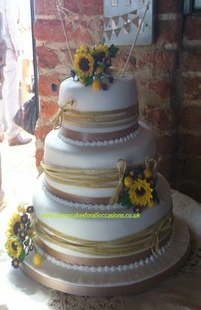 Most wedding venues and caterers provide a display stand and knife for the cake. If not, then I am able to arrange the hire of these but a deposit will be payable and you will need to ensure that these are returned on the Monday following the wedding but preferably no later than the following Wednesday, or a later date subject to availability. If this will prove difficult then some couples choose not to use a display stand and simply ask for the cake board to be decorated in an attractive way. A double cake board on the bottom tier can give a stepped-up appearance. There is also the choice of pillars or acrylic separators. I will deliver and set up your cakes for you on the day but charge an additional fee for doing so depending on the size and detail of the cake and the distance to your venue. If you are having a fruit tier to save for your First Anniversary then correct storage is important. Most people will tend to store their cake in the freezer. Whichever method you use it is recommended that the cake be first wrapped in greaseproof paper, then Cling film making it airtight – this stops any air or bacteria getting to it and also stops the cake absorbing smells from the freezer. Simply take it out a day or two before you want to use it. Otherwise the cake can be stored preferably in a dark cupboard away from direct sunlight.